Address: Shaftesbury Avenue, London, WTV 8BA. Experience the longest running musical Les Miserables at the opulent Queen’s Theatre! Victor Hugo’s mesmerizing show Les Miserables with the background of French Revolution is a poignant saga of a prisoner on parole, Jean Valjean, whose past is threatening to devastate his beautifully crafted present. This immensely popular saga is enjoyed by more than 54 million people across the globe in 38 countries and approximately 21 varied languages. This immensely loved musical has won several prestigious awards as well as accolades. The heart touching play is the tale of passion, humanity and perseverance amidst all the odds and adversaries. You can feel the intensity and impact of Les Miserables at the stunning Queen’s Theatre. Queens’ Theatre has been built under the supervision of architect, W G R Sprague. The magnificent building will remind you about the Renaissance Revival period and was built in true Edwardian style. In the year 1959, the opulent Queen’s Theatre had undergone some renovations or reconstruction after bombing attack. During the reconstruction of the auditorium, foyers, bars and theatre exteriors were also updated with Edwardian features. In the year 1907, Queen’s Theatre marked its opening and some of the popular stars of 20’s and 30’s were Fred, Adale Astaire, Tallulah Bankhead, Jack Hawkins and Gertrude Lawrence. Queen’s Theatre is positioned at London’s Shaftesbury Avenue featuring world class services, such as infra-red or loop sound amplification and services for wheel chair users. Enjoy the longest running musical Les Miserables running with packed houses at Queen’s Theatre London. 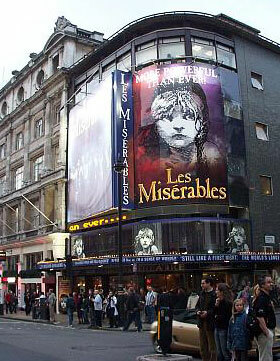 For a hassle free viewing, you must book online advance official Les Miserables Theatre Tickets. We offer premium quality Les Miserables Theatre Tickets as well as Cheap Les Miserables Theatre Tickets. You can choose in accordance with your requirements. To make thing more enjoyable, you can also opt for London Theatre Breaks. With Les Miserables Theatre Breaks, you would be provided with top quality Les Miserables Tickets and luxurious London Hotel Packages. Copyright © 2015 London Theatre. All rights reserved.